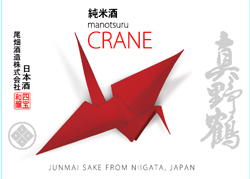 The red crane is a symbol of good luck. This is a junmai sake, which means it is pure rice sake (no alcohol was added). An elegant, slightly earthy sake with notes of stone fruit, pistachios, and white chocolate. Please drink this sake chilled or at room temperature. A great all-around sake, it goes well with a wide range of foods. Obata Shuzo has been hand-making boutique premium sake since its founding in 1892, using pure, soft groundwater and world-famous sake rice. The kura is still owned and managed by the Obata family (Rumiko Obata). The toji (master brewer) is the acclaimed Kenya Kudo. The brewery has received multiple Gold Medals at the National New Sake Competition and the International Wine Challenge.. The brewery has been featured in Wine & Spirits, the Los Angeles Times, Wine Enthusiast, and Wine Spectator. Obata Shuzo is located on Sado Island in the Niigata prefecture of Japan. Niigata is famed for its jizake, or unique, “micro-brewed” sakes with character. Niigata is considered by many to be the best place in the world to find high quality sake. The toji in Niigata use highly polished rice and exacting filtering techniques to create a distinctive style. They are aided by the cold climate and the isolation of the mountains, as well as good regional rice and pure mountain water. (Source: The Sake Companion). Sado Island has been in the forefront of wildlife and nature conservation. Particularly, they have concentrated their efforts on conserving the Japanese Crested Ibis (Toki in Japanese). An island that is kind to the Ibis is kind to humans as well, creating a safe atmosphere for living. Such an atmosphere yields positive results to every process of sake brewing.